Greg Beumer of the Randolph County Economic Development informed those at the banquet of the county’s happenings. UNION CITY, Ind. 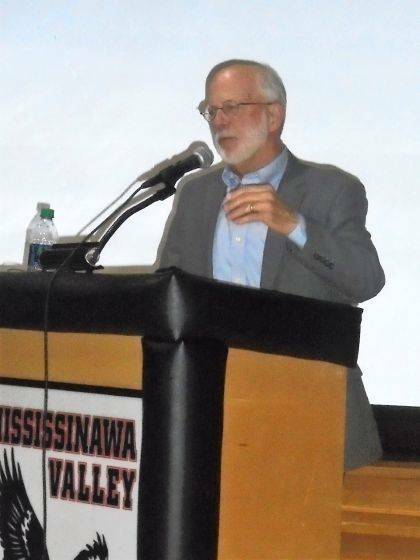 — “Building Our Future Together” was the theme of this year’s Union City Chamber of Commerce Banquet held Thursday at Mississinawa Valley Schools, where numerous awards were presented to individuals, organizations and businesses. Brian Merrill served as master of ceremonies for the evening program, which also featured a dinner catered by Bouser’s Barn. Entertainment was provided by the Swinging Hawks, Mississinawa Valley’s swing and jazz choirs. Special speakers for the evening were Greg Beumer of Randolph County Economic Development and Mike Bowers of Darke County Economic Development, as well as Chamber President Susan Linder. Each one of them updated the audience with happenings within their respective organizations. Beumer talked about such topics as consolidations and new construction. Linder then talked about the current membership drive. Special Achievement Awards to Reagan Hoggatt, daughter of Brad and Amy Hoggatt, and Sidnie Hunt, daughter of daughter of Wade and Billie Hunt. Distinguished Service Awards to Myrna Brenner (not in attendance), who was one of the first people to be on board when Preservation (the local society) formed to save the historic Kirshbaum Building; Community Help Center; and Wesley United Methodist Church, pastored by Geoff Grow, who gave the invocation at the banquet. Rising Star Awards to Freedom’s A&W Root Beer, Union City Country Club and Oliver’s Butcher Shop. Female Volunteer of the Year to Anita Amspaugh, a lifetime Union City resident. Male Volunteer of the Year to Brad Hoggatt, a fourth-grade teacher and Music K-6 at North Side. Hub Award to Citizens State Bank. Outstanding Business of the Year to Jim Keen of Keen’s Auto Sales. Reach Linda Moody at 937-548-3330. This entry was tagged Indiana, Union City, Union City Chamber of Commerce, Union City Chamber of Commerce Banquet. Bookmark the permalink.